Making a very interesting, yet a serious, move, the US has announced operation “Euphrates Anger”, to be conducted by Syrian Democratic Forces (SDF), a coalition of different US-backed militias, to re-take the city of Raqqa, the current capital of the Islamic State in Syria. While the announcement has come just three weeks after the beginning of the operation to liberate the city of Mosul, IS’ capital in Iraq, and seems a ‘logical’ development, there is much more to Raqqa operation than simply meets the eye. On the surface, this operation is purely anti-IS and is aimed at symbolically defeating the group by capturing its ‘capital’. In reality, however, this operation is aimed at strengthening the US-backed forces in Syria and thereby disturb the Syrian army’s battle for Aleppo. A pertinent question that arises here is this: If the US was really serious about engaging a local force to liberate the city of Raqqa, which other force could have been better and more “local”, having a legitimate local base, than Syria’s own army, which is currently battling IS and other groups in the city of Aleppo? Of course, the US and its allies would not want to have Syrian army as its ally, nor wold they want it to appear as the liberator. Their objective of keeping Syria immersed in conflict, and the ultimate objective of destroying Syrian army and dismantling Assad as its president, can be met only when the Syrian army remains engaged in battles either against the Islamic State or against the US-backed SDF. Therefore, placement of SDF as the leading fighting force in Raqqa is a very calculated move to deny the Syrian or Russian militaries the chance to actually liberate the city from the clutches of sponsored-terrorism. While the stage was already being set for an operation to ‘liberate’ Raqqa from IS, this is strange enough to note that this operation has come at a time when IS fighters were easily shifting from Mosul to Raqqa and when the West was already aware of it. A Kurdish intelligence officer told Fox News earlier in the week that IS fighters are “running away massively” in the direction of Raqqa. Interestingly enough, the West was aware of this movement of IS fighters. French president Francois Hollande said last month there was evidence that Islamic State fighters were fleeing to Raqqa, and that everything must be done to stop them regrouping there. While this ‘transportation’ of IS does raise question, first and foremost, about the efficiency and effectiveness of the battle for Mosul, it also signifies that the real target of the US and its allies remains Syria and, by default, Russia. Instead of blocking the route from Mosul to Raqqa, IS fighters were deliberately allowed to shift to Raqqa in order to create the necessary excuse to allow the US to revamp its extremely weak position in Syria, where the Syrian army, being backed by Russia, has achieved considerable success against IS and other West supported terror groups. The US clearly estimates that the Syrian military and its Russian allies are sooner than later going to liberate Raqqa. Given this, the US does not want to suffer another public relations setback, the kind of which it had earlier suffered at the time of liberation of Palmyra and the kind of which they are suffering now when Aleppo is heading towards an eventual fall at the hands of Syrian and Russian forces. However, this situation is setting a dangerous stage, likely to cause more harm than good to the people of Syria. For them the situation would qualitatively remain the same if they are subdued by IS or by the US-backed so-called “local forces” i.e. the SDF. Militarily and ideologically trained on the same lines as IS, there is little in it to doubt that SDF would not impose its own ‘jihadist fanaticism’ on the people of Raqqa, creating an essential context for the Syrian army to move towards Raqqa to liberate its territory and its people from these terror forces. 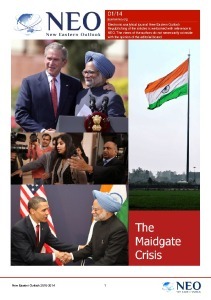 A prolonged crisis looming large? With Syrian forces, backed by the Russian Air Force and Russian Special Forces heading east to Raqqa, and with SDF, backed by the US-led coalition forces rushing to capture Raqqa, an explosive situation is developing, capable of leaving widespread regional and international ramifications. In other words, there is a distinct potential that, in the race for Raqqa, the Syrian/Russian alliance might find itself face to face with the possibility of direct military conflict with the US/SDF alliance. Clearly Moscow is sensing such a situation and has accordingly, making a sound strategic move to maintain balance, deployed its aircraft carrier Admiral Kuznetsov off the cost of Syria. Even if a big battle does not take place, which is by all means unlikely to happen, the US is certainly preparing to complicate the Syrian crisis. While the US has been trying its best to stall the defeat of “rebels” in Aleppo by doing persistent propaganda against Moscow for committing “war crimes”, control of Raqqa would further allow the US to keep a direct covert influence on Aleppo, and co-ordinate SDF with those “rebels” now trapped in Aleppo. The choice of Raqqa is, in this context, a strategic move on the part of US as its main interest clearly lies in delaying as far as possible the capture of Aleppo and Raqqa by Syrian government forces. 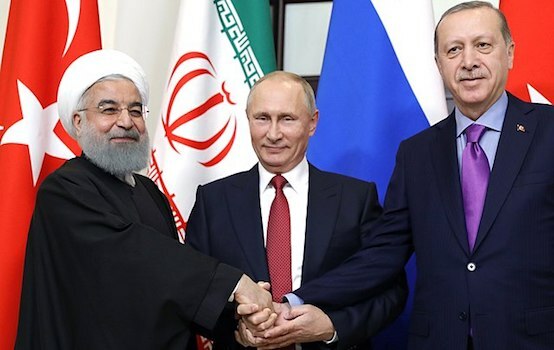 However, were this to happen, it would be only a matter of time before Syria will eventually be cleared off all jihadists, moderate and not-so-moderate, groups and force the US out of the region. Therefore, operation “Euphrates Anger” is neither about defeating terrorism in the region nor about denying IS, what French authorities say, a territorial base that it uses to launch attacks in Europe and elsewhere. 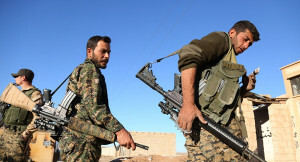 For all practical purposes and given the nature of US objectives, if the SDF succeeds in imposing control over the city and the province, the US will be successful in cementing control over the area and pass it to the hands of its proxy terrorists once again and keep the ‘war’ alive and deny peace.